So far this year we are experiencing typical Canadian yoyo weather patterns with bone chilling cold to mild spells. With the recent shot of mild weather and rain we had the ice break up with large chunks deposited on the river banks. 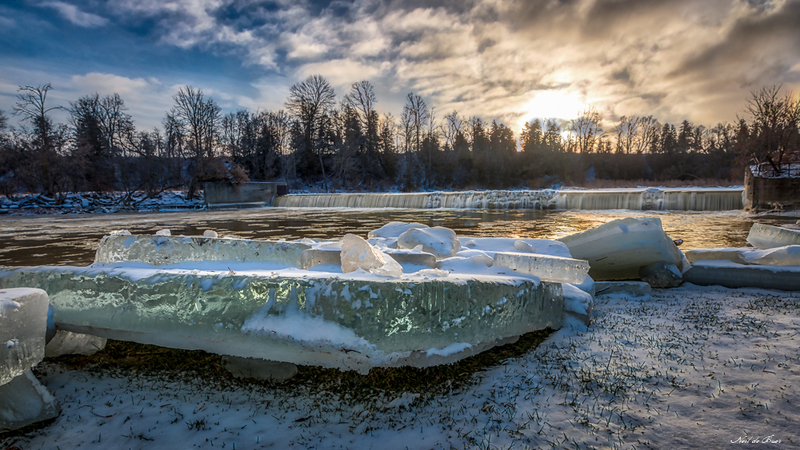 Here we have a nice pile of ice at the dam in St. Jacobs. 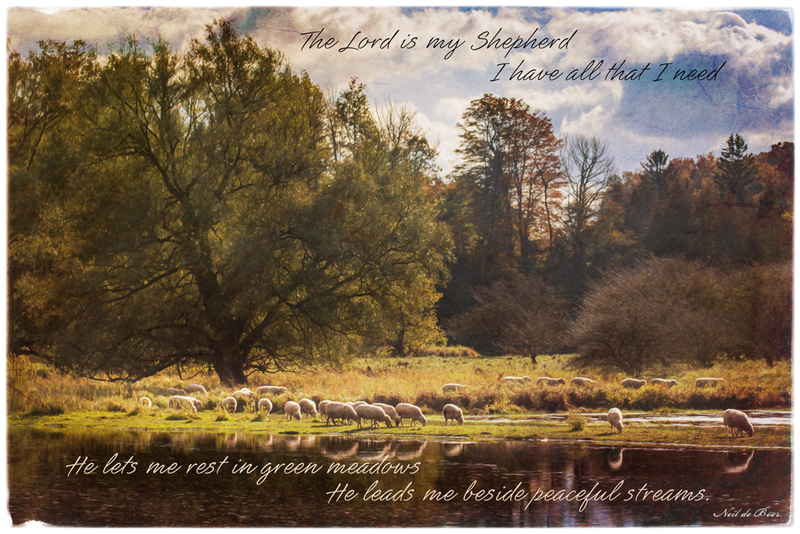 I was taking photos down at the dam near St. Jacobs the other day when these sheep came down to the river bank to graze. I put on the telephoto lens and took this shot from across the river. 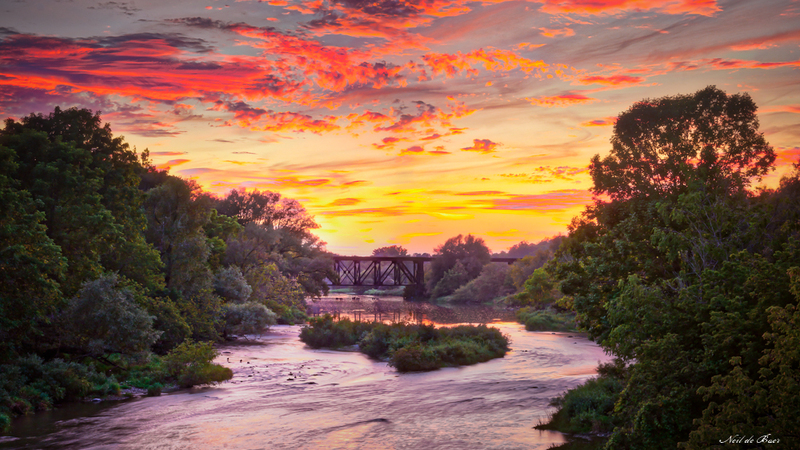 A shot take from the bridge over the Conestogo River in St. Jacobs. As the sun dipped below the horizon the sky danced with colour! We were kayaking down the Conestogo River on Saturday afternoon. When we left the sun was shining and the weather forecast did not call for rain until evening. As the afternoon progressed these cotton candy clouds moved in. I have never seen anything quite like it before. After that the rain clouds moved in and we got soaked. Despite the weather we had a good little trip and saw lots of different birds which I will post at a later date. 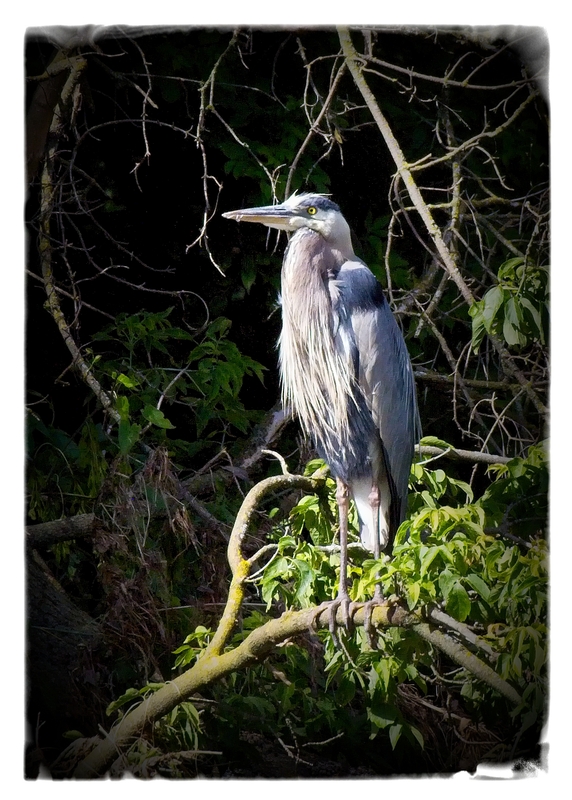 On Sunday I went for a bike ride down the trail along the Conestogo River south of St. Jacobs and came across this guy standing watch on the other side of the river. They are usually pretty skittish and fly away at the first sight of a human but he was content to stay put while I took his portrait. Today I got an email from a friend telling me that the water going over the St. Jacobs Dam was starting to freeze. Our own mini Niagara Falls she said. With that information I planned to go after work to take a few shots. I was curious about where the sun was setting this time of year in relation to the dam so I went to my favorite website, The Photographers Ephemeris to find out. I was in luck! 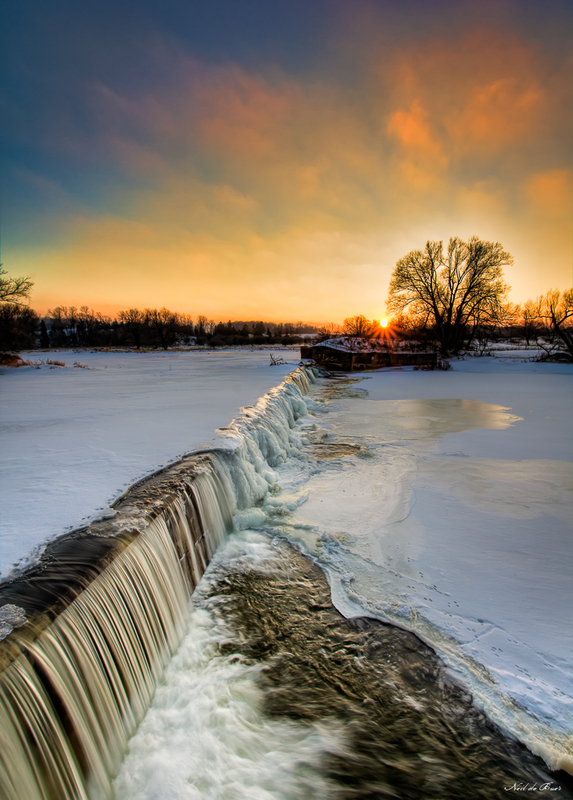 The sun would be setting in line with the falls. All I needed now was a good sunset. I arrived with time to set up and as the sun went I took shots from several angles. I was not disappointed. This is one of my favorites. Thanks Marion for the suggestion! I’ll have to keep an eye on this location to see if the frozen falls expands. 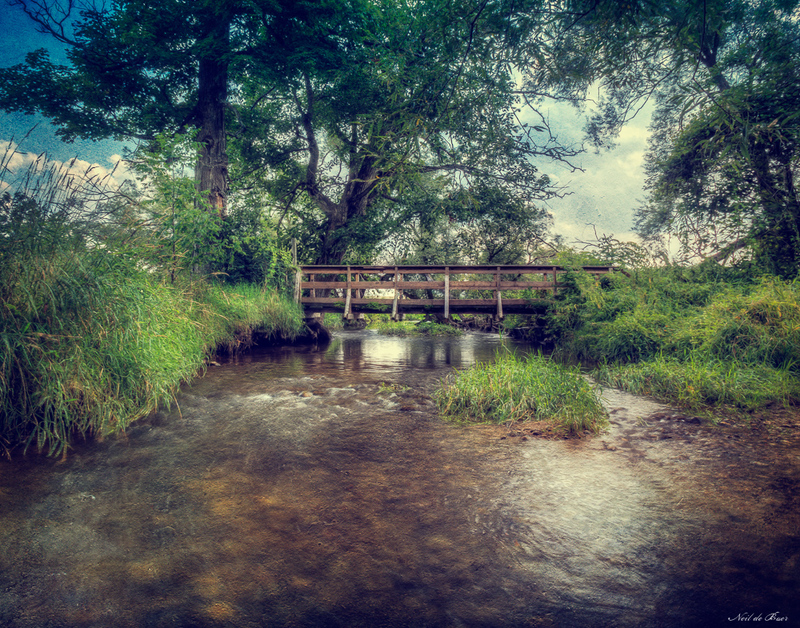 This footbridge can be found on the Health Valley Trail that meanders its way along the Conestogo River between the villages of St. Jacobs and Conestogo. It is a beautiful and relaxing spot! The effect applied to this photo is a result of multiple process from HDR to texture blending. I just kept experimenting with it until I got a look I liked.